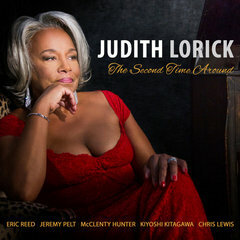 Lovely sophisticated jazz vocals Judith Lorick – Second Time Around: An absolutely splendid lineup of players has a lot to do with total success on a new release, and Judith’s got it Down on this one… in addition to her comforting vocal work, you’ll hear piano from Eric Reed, trumpet by Jeremy Pelt, drums from McClenty Hunter, bass by Kiyoshi Kitagawa and tenor saxophone from Chris Lewis… songs like the jaunty “Wild Is The Wind” will make you a believer in Judith’s album, I’ve no doubt – just splendid! (no samples are up yet, since this doesn’t go HOT until the 28th of September; I’ll come back and add them in when it’s live). One thing that would be nice as it gets closer to the official date is a live performance video trailer of Judith’s excellent jazz talent… in the meantime, I can tell you that if it’s “sophisticated” you’re looking for, you’ll find “I’m Gonna Laugh You Right Out Of My Life” very attractive… what’s most unique about Judith’s singing is that she’s (unquestionably) “got the magic”… total groove, as you listen to a piece of her soul – not to mention that Eric’s keyboard on this one is pure perfection! If you’ve been feeling “down” or “out”, you won’t be for long when you scope out Judith’s performance on “Lucky To Be Me”… her joy simply shines through each and every note on this tune. Of the eleven songs offered up, it’s definitely the classic piece “For All We Know/I’ll Be Seeing You” that is my personal favorite… Judith’s passion in this vocal will dig down deep into your core & bring back memories you’d thought long lost. I give Judith and her fantastic players a MOST HIGHLY RECOMMENDED, with an “EQ” (energy quotient) rating of 4.98 for this excellent vocal jazz adventure. Personnel: Vocals - Judith Lorick; Piano - Eric Reed; Trumpet - Jeremy Pelt; Drums - McClenty Hunter; Bass - Kiyoshi Kitagawa; Tenor Saxophone - Chris Lewis.